God has been putting up with us and our sin for a very, very long time. One massive overarching theme that we can see in Scripture is that God has been slowly moving his people further away from sin and closer towards his ideal. In the New Testament we see a massive jump forward with the arrival of Jesus. God came to us in the flesh to say “enough is enough.” No more misinterpretations, no more accommodations, no more concessions. In this first article of a new series called “Enough is Enough” we’ll be looking at animal sacrifice in the Old Testament and how God never wanted it in the first place. The ancient Israelites had a barbaric and bizarre practice of killing animals and then burning their dead bodies. While many assume that God wanted animal sacrifices, a closer look at scripture reveals otherwise. All Ancient Near Eastern people, not just the Israelites, sacrificed animals as a way of appeasing the gods. In fact, this has been a staple of human religion around the world from the start, as Genesis 4 (with Cain and Able’s sacrifice) illustrates. Interestingly enough, there’s no suggestion in Genesis 4 that God asked Cain and/or Able to sacrifice anything. They just started doing this. Some have suggested that this reflects the fallen human sense that we are estranged from God and that he’s angry about it, so we instinctively want to do something to rectify this. In light of the almost universal religious practice of sacrificing animals, it seems reasonable to assume that the Israelites had been sacrificing animals a long time before God ever began to instruct them. In fact, the way some Old Testament authors refer to the sacrifice as producing “a pleasing aroma to God” reflects the cultural indebtedness of this practice, for we find this same phrase used by other people long before the Israelites (Exodus 29:25, 41; Leviticus 1:9, 13, 17). Most are familiar with the story of Abraham and Issac. God tells Abraham to go up a mountain and sacrifice his son, but at the last minute he stops him (Genesis 22). Most read this story as God testing Abraham’s faith, but it is actually much more than just that. If you look closely you can notice some interesting things about the story. Without knowing the context of the world that Abraham lived in it is easy to overlook the most important lesson this story teaches us. In the time Abraham lived there wasn’t a pagan god in the land that didn’t demand child sacrifice. Human sacrifice was common place and the gods demanded first born children most often. So when Abraham heard God tell him to go sacrifice his son, this was no surprise to him. He expected it. But instead God stays his hand. 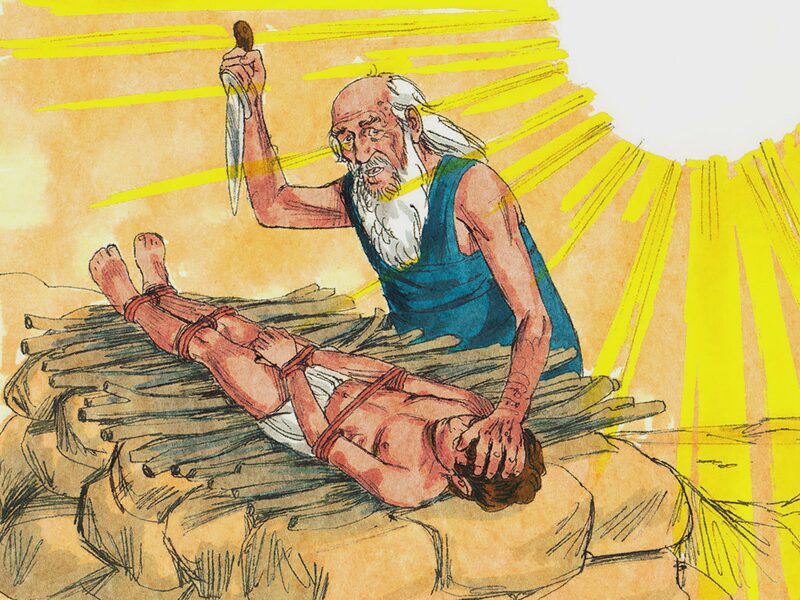 That is the whole point of the story: God is putting an end to the ritual of child sacrifice (Leviticus 18:21, 20:3; Deuteronomy 12:30-31, 18:10). Human sacrifice was the norm worldwide but God was revealing that he is different from other gods. This was God’s first step in taking mankind away from sacrifices: moving from human to at least animal. Since God must relate to people where they are at in order to gradually lead them forward, just as a missionary must do when going to pagan cultures, it seems that God accepted this barbaric practice as an accommodation to his fallen, culturally conditioned people. In fact, one passage in Leviticus indicates that God commanded animal sacrifices as a way of helping his people to stop worshiping demons (Leviticus 17:7). So while God accepted this practice, he changed its meaning. Instead of being used to appease God’s wrath, as pagans have always believed, these sacrifices were used to remind people that covenant breaking with the God of life inevitably leads to death. Animals were sacrificed not because God needed them to forgive people but because his people needed them to remember the death consequences of sin and to therefore repent when they’d broken covenant with God. Origen, like other Christian thinkers of the time, did not believe that animal sacrifices were God’s idea. The Jews were already steeped in this ancient barbaric practice, and God saw that it was pulling them in the direction of pagan polytheistic idolatry. God thus choose the lesser of two evils when he decided to block the pull toward polytheistic idolatry by stooping to allow the Jews to make their sacrifices to him. Later in Israel’s history, when people began sacrificing animals without repenting in their hearts, the Lord told them (through prophets like Isaiah, Hosea and Amos) that he despised their sacrifices, for they are meaningless without a change in heart (Psalm 51:16-17; Isaiah 1:11-14; Micah 6:6-8: Amos 5:21-25; Hosea 6:6). Even Jesus quotes Hosea when speaking to the Pharisees saying, “I desire mercy, not sacrifice” (Matthew 9:13). The law is only a shadow of the good things that are coming—not the realities themselves… …those sacrifices are an annual reminder of sins. It is impossible for the blood of bulls and goats to take away sins. Therefore, when Christ came into the world, he said: “Sacrifice and offering you did not desire… with burnt offerings and sin offerings you were not pleased.” …we have been made holy through the sacrifice of the body of Jesus Christ once for all. In Hebrews 10:1-14 we are told that animal sacrifices were a reminder of sins, but could never take the sins away. No matter how many times the Israelites killed animals, their sins were never taken away. “Sacrifices and offerings, burnt offerings and sin offerings you did not desire, nor were you pleased with them“ (Hebrews 10:8). Jesus came to do away with sacrifices by becoming the final sacrifice, the first and only sacrifice that could actually set things right. It is clear that once Jesus arrives, the sacrificial system that God had been accommodating is done away with. This side of Jesus, Christians don’t sacrifice animals. We don’t do it. We don’t because it’s been revealed to us that it was never desired by God, and Jesus is the only sacrifice that mankind would ever need. God never wanted animal sacrifices. He used them for a time, but now with Jesus they are done away with once and for all. Enough is enough. Lubac, History and Spirit, 285.